This Perch is a great opportunity to introduce you to the world of ‘Windsor’ chair making and the techniques associated with this iconic style. Ideal for beginners and those seeking the ‘Windsor’ chair experience without the intensity of a six day course. 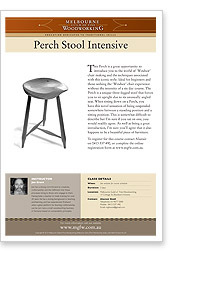 The Perch is a unique three-legged stool that forces you to sit upright due to its unusually angled seat. When sitting down on a Perch, you have this novel sensation of being suspended somewhere between a standing position and a sitting position. This is somewhat difficult to describe but I’m sure if you sat on one, you would readily agree. As well as being a great introduction, I’m sure you’ll agree that it also happens to be a beautiful piece of furniture. 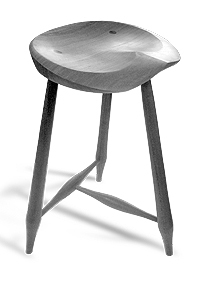 The Perch Stool course is a great opportunity to learn a wide range of skills in carving, turning and chair construction, and come away after three days with a finished project. The instructor, Jon Grant, keeps the class on track to be able to finish the project, but also gives the class a relaxed atmosphere. Living the Dream! Having spent many an hour dreaming of making my own furniture, I was finally able to make it a reality having recently attended the three day Perch Stool workshop with Jon, Alastair and his team. What an amazing three days! Although the course was intensive, the atmosphere was always relaxed, with Jon ever ready to help and guide us through the various, and often complex stages of the Perch Stool. I found all three of the guys to be extremely generous, who were never shy in being prepared to share their in-depth knowledge and skills, which more often than not, was delivered with an abundance of good humor and musings. Now as I sit on this wonderful stool, I have to pinch myself to so as to be reminded that it was I who managed to make something so beautiful. I would like to take this opportunity to thank Alastair and Jon from the Melbourne Guild of Fine Woodworking, for providing this wonder course, which has in turn given me the confidence, and patience to be able to continue making lovely pieces of furniture, with my own bare hands. Having thoroughly enjoyed the course, where a friendship with Alastair, Jon and Doug, was built up, I will most certainly be back in January to undertake another course. I would highly recommend to anyone who has ever thought about taking up a Woodworking or French Polishing course, to consider enrolling with the Melbourne Guild of fine Woodworking. Thank you Alastair for a wonderful three days – I can’t wait to come back. PS. Thanks for the wonderful morning and afternoon teas.